In addition to random moments, life is made of small routines—a short run, a quick clean-up of the kitchen or bathroom, saying good-night to a child. Chunks of time make up our day. And you can write your dissertation one chunk at a time. 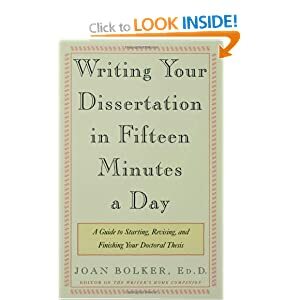 Most graduate students come across Jane Bolker’s book, Writing Your Dissertation in Fifteen Minutes a Day. Jane Bolker was co-founder of the Writing Center at Harvard, and she also directed many dissertations. She writes from her experience of helping ABD’s to get started writing and then to stick with it. Bolker’s book urges people to write for a small period of time every day, the amount of time it would take you to fill the dishwasher and clean the kitchen or read a few books at nighttime to your child. The Pomodoro is another a great tool for dissertation writers. The little clock that looks like a tomato, or one of the new apps or other countdown timers, has helped many writers ease into writing, one 25-minute chunk at a time. It helps writers push away distractions, to focus, and then to stick with the writing for the length of the Pomodoro. A Pomodoro can be an essential aid to someone balancing a dissertation with a job and family, where planning is a way of life. One Pomodoro or two Pomodoros becomes a unit of time that you can remember. “I worked two Pomodoros every day last week at lunchtime,” a client says. It is a tool that helps establish a habit. Read more about it here. If you need help in restarting your writing and then establishing a productive routine, coaching is another tool that has helped many writers. Dissertation coaching can help you look again at the parts and pieces of your writing project. Coaching will introduce you to many strategies that will help you successfully manage your work. And you will be talking to someone interested in your personal process, someone, most likely, who once lived the life of the ABD. I would love to hear from you. August is a great time to try coaching. One of the joys of life is to visit one’s adult children, whether they live close by or at a distance. After graduating from college, our daughter remained in the New York area, married, and bought a house. 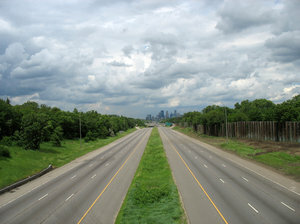 On the way home to Northern Virginia after a recent visit with her, I thought how each visit to the home of one of our adult children is like a short course or even a Boot Camp. This Boot Camp helps us to adapt to their changing lives and maturing personalities. I don’t mean Boot Camp in the sense of a grueling experience, but one with boundaries of time and with opportunities of being near to one another, making it easier to spot ways to make life better. I coach writers. Many of my clients ask me if Boot Camp would work for them. I occasionally offer a limited-enrollment Boot Camp, tailored to each participant. Boot Camp makes a lot of sense, with its limited time period when someone can focus daily on a specific writing project and where one anticipates making changes to grow and get better. The people who enroll in Boot Camp come with an impressive academic and professional history and, typically, have been strong writers. But new expectations and self-doubt have derailed them, slowing and or even stalling their writing. Boot Camp offers writers a safe place to reshape their usual way of approaching their work, and they are not isolated as they do it. As their coach, I give support and accountability as the participants streamline their writing process, gain insights and improved skills, and set up new habits that they can use after Boot Camp ends. Like writers enrolled in Boot Camp, when my husband and I visit our adult children, I see much in their homes and lives that seems familiar. Our personalities and our conversations move in a comfortable dance-like pattern. However, these short visits bring into relief unexpected changes where I trip up. And then I get to try out new steps, hoping to get better in that unpredictable and wonderful dance with adult children. Boot Camp has much in common with these short visits. Both are worthwhile, good things to do. In both places you need to expect the unexpected and be ready for a bit of a challenge. With each, you can learn something valuable and new in a setting which seems very familiar. Should you try Boot Camp? Absolutely! If you are trying to get a toe-hold on your dissertation or an article out the door, consider how two weeks where you write every day and are accountable for doing what you said you would do will jump-start your work. And it will give new life to your flagging strengths of perseverance and resilience. What would you like to know about Boot Camp? I would love to hear from you. If you are navigating change in your family relationships, I would love to hear about that, too. 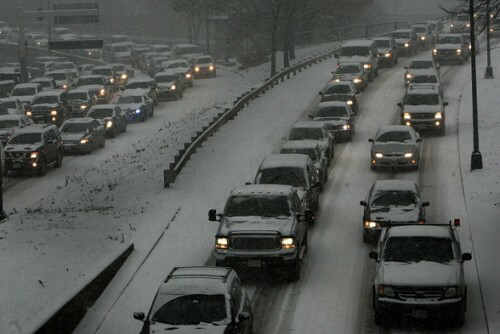 Balancing work and parenting is a neat trick in the best of conditions, but the cold weather and snow in North America may have upended the balance. For many parents, it’s been all parenting and very little work. The frigid temperatures have made going to school a health hazard, and so working parents are giving up vacation days in order to be home with their children whose schools are closed. If you are among those parents who not only work outside the home, but, in addition, you are writing a dissertation or an article or a book, you are already hard pressed to find a time to write. If the whole family seems to be at home recently every day, all day, the challenges to your writing are huge. One client told me that on the one day during the week in ordinary times when she would have been able to write, she instead had a cooking and baking project with her bored child who once again was home from school because of the weather. It’s that impossible juggling act of trying to occupy various roles fully and deeply. When you remember to ask yourself where you have choice, you are on the right track. If you’re stuck in such a predicament, what successful strategies have you devised?